Eggnog is a holiday tradition and, in fact, it is one of those few items that you can really only find during the holiday season (unless you make it yourself, of course). It is rich, eggy and has a unique flavor to it. Most people drink it straight, or with a bit of liquor added to it, but eggnog can be used for all kinds of other things in the kitchen. Its eggy flavor lends itself particularly well to custard-based dessert, like this bread pudding. 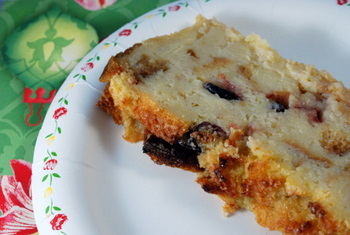 Bread pudding is easy to make and this one definitely has a holiday flair to it. Most bread puddings have a base made up of milk or cream. This one has a base made primarily of eggnog. The eggnog is mixed with a bit of milk and nutmeg and vanilla are added to complement the flavor of the ‘nog. I used a white sandwich type of bread because it has a very mild flavor. Challah or brioche will also work very well. I’ve heard a bit of debate as to what the “proper” booze to add to eggnog is. Some say rum, while others prefer brandy or bourbon. I’ve always used bourbon myself, so I opted to spike my cranberries with a little bit of it for this recipe. I simply rehydrated my dried cranberries in abut 1/3 cup of bourbon by letting them soak in it for about 30 minutes (you can also zap the mixture in the microwave for a few seconds to help the process along). A lot of the liquor goes into the dried fruit, giving it a very subtle zip. If you prefer not to use alcohol, you can rehydrate the berries with the same amount of water before stirring them into the bread pudding. The finished pudding is very Christmasy, with a wonderful flavor and aroma of vanilla and eggnog. The cranberries contrast well with the custard-soaked bread and add a nice, subtle zip of bourbon. This bread pudding is baked in a loaf pan and should be served in slices (this actually makes it much easier to portion than bread pudding baked in a big casserole dish). Let it cool completely in the pan before slicing to ensure that the pudding sets up, then reheat slices in the microwave before serving. Preheat oven to 375F. Grease a 9Ã—5 inch loaf pan (do not flour). In a small bowl, combine cranberries and bourbon. Let soak for 30 minutes, or cover with plastic wrap and heat in microwave for about 30 seconds (until very warm) to help berries rehydrate with bourbon. If microwaving, let mixture cool to room temperature before adding to the rest of the bread pudding mixture. In a large bowl, whisk together milk, eggnog, eggs, sugar, nutmeg and vanilla. Add bread cubes and gently fold them into the mixture until all the custard has been absorbed. Stir in cranberries and remaining bourbon (any that hasn’t been absorbed into the cranberries but is still in the dish). Pour into prepared pan, spread into an even layer and sprinkle top of loaf with additional sugar, if desired. Bake 50-55 minutes, until a knife inserted into the center of the loaf comes out clean and the top is golden brown. Allow to cool in pan and then transfer to a plate for serving. Serve warmed. Store leftovers in the refrigerator. Next PostNext Reusing parchment paper? One year, for some reason, while I was at my mothers three of us brought egg nog. Too much egg nog! So we did just this, made a bread pudding with one of the quarts. (It was a big bread pudding.) I don’t think I added any sugar at all though. 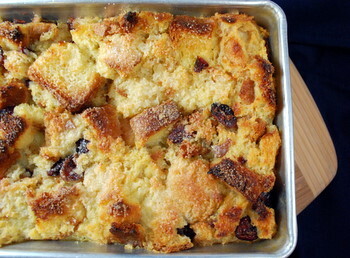 I like a flavorful but less-sweet bread pudding and then make some sort of hard sauce for it. That looks really fabulous! I must bookmark this for holiday parties – thanks for the great recipe! Boy, does this look beautiful. For sure I will try it soon. Maybe add some chopped pecans. Thanks for sharing. Sounds wonderful, i would make this however my son and I are the only ones in the house that like eggnog. He is only 8 so I guess the alcohol would have to go. I will have to try this when I have a gathering to bring something to. Pudding is one of my favorites! I’ll try to do this at home and hope I could do it well. I’ll treat this to my family this coming holiday. This is in the oven right now. Can’t wait to try it. Had this last night. It was pretty good, 4 out of 5 stars. I decided to heat up some more for breakfast this morning and my wife made an impromptu rum butter sauce to pour over the top. The addition of the sauce bumped it up to 5 stars. Amazing pudding. Thanks. i have to tell you i made this and was amazed at how easy it was to make!!! my husband was very skeptical (why can’t you just make something NORMAL like chocolate chip cookies?) until he tasted it! He is a convert and i have to say next time i will add some french vanilla ice cream to it when serving as desert – AMAZING! 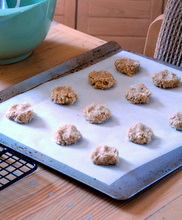 bonus – it also makes the house smell SO good wile baking! Fabulous. I made a batch of homemade egg nog and have a ton left over – I’m so sick of drinking egg nog! But this is a great way to use up my leftovers. THANKS for a wonderful post! You could also rehydrate the cranberries with the same amount of unsweetened cranberry juice. Lightly toasting the bread in the oven gives it a special flavor, and a whisky sauce would be just as delicious! I just made this recipe for a church dinner and it was a huge hit! I increased the recipe by 50% and baked it in a 9×13 pan at 350 for about an hour and it was perfect. Anyone who likes eggnog will love this recipe. I added the finely-grated rind of an orange to jazz up the flavor a little – and a 1/4 tsp of cinnamon to add to the nutmeg. As the eggnog was already very sweet, I cut down the sugar added. The final result was delicious! Standard recipe for bread pudding is 4 C milk, 4 eggs, & sugar. This recipe is less liquid than standard but has more bread and eggnog, which is a different consistency. Double check oven temp. Milk products, even cooked, should be kept refrigerated and not shipped.